In 1216 AD, Pope Honorius III succeeded in getting some more Europeans to agree to try again to conquer Jerusalem from the Ayyubids. This time, the Pope would be in charge instead of European kings. Frederick II of the Holy Roman Empire wanted to come along, but the Pope said no, this crusade was for the Pope, not for kings. Some Hungarian troops went along. The Crusade went south to Egypt, following the original plan of the Fourth Crusade. In 1218, the Crusaders made an alliance with the Seljuk sultan Kay Kaus I against the Ayyubids (Kay Kaus may have thought of the Crusaders more as paid mercenaries, the traditional role of Normans in this area), and attacked the port of Damietta in Egypt. There was a long siege, in which many people on both sides died of disease. In 1219, the Crusaders did finally manage to capture Damietta, but then they immediately began to fight among themselves over who would be in charge there. In 1221, the Crusaders marched towards Cairo, to try to take over more of Egypt, but the Ayyubids just used the Nile River to flood all the roads, trapping the Crusaders. The Crusaders had to make peace in order to get out. They gave Damietta back to the Ayyubids and went home. Cite this page: Carr, K.E. 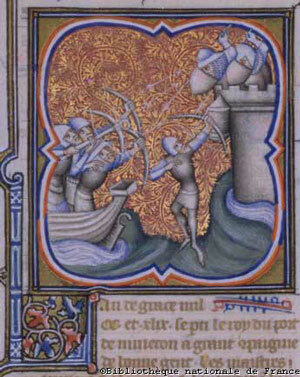 Fifth Crusade – Medieval history. Quatr.us Study Guides, August 3, 2017. Web. April 23, 2019.